With Microsoft Teams external access, users from other domains can participate in your chats and calls. You can also allow external users who are still using Skype for Business to participate. Guest access gives access permission to an individual. External access gives access permission to an entire domain. Guest access, once granted by a team owner, allows a guest to access resources, such as channel discussions and files, for a specific team, and chat with other users in the team they have been invited to. With external access (federated chat), the external chat participants have no access to the inviting organization’s teams or team resources. They can only participate in one-on-one federated chat. Tenant admins can choose between the two communication options depending on which level of collaboration is desirable with the external party. Admins can choose either approaches or both, depending on their organizational needs, but we recommend enabling guest access for a fuller, collaborative Teams experience. See the following table for a comparison of external and guest access features. 1 Provided that the user has been added as a guest and is signed in as a guest to the guest tenant. 2 Only by email or Session Initiation Protocol (SIP) address. 3 External (federated) chat is 1:1 only. You can use the Microsoft Teams & Skype for Business Admin Center to manage external access. In the Microsoft Teams & Skype for Business Admin Center, select Org-wide settings > External access. Toggle the Users can communicate with Skype for Business and Teams users switch to On or Off. 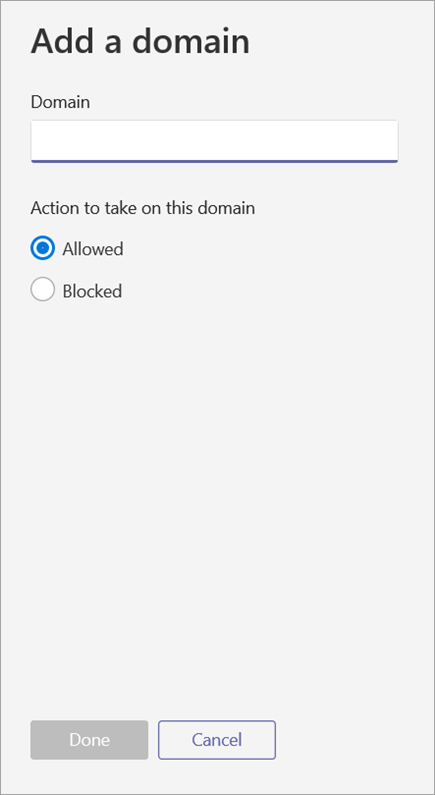 Follow these steps to add a domain or turn off external access for a domain. The Add a domain pane appears. Under Add a domain, type the name of the domain; for example, type Contoso.com. Select Allowed or Blocked. You can change this setting at any time. After you add a domain, you will see the domain name and status added to the list of domains on the External access page. For information about guest access in Microsoft Teams, see Manage guest access in Microsoft Teams.